Energy efficiency contractors and developers have many projects to install, but may not have the capital to often there is a mismatch between the timing of their revenues on one hand, and their expenses and payables on the other. They seem to be continuously waiting for customers to pay or for leasing companies to pay. In the meantime, equipment must be purchased and installers must be paid. 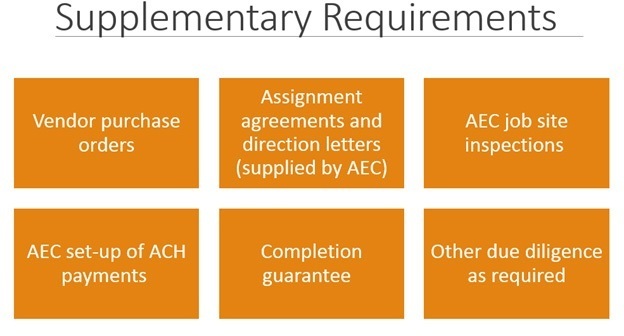 AEC provides project-specific job completion capital to developers and contractors based on specific signed agreements with customers and secured (third party leasing companies etc.) 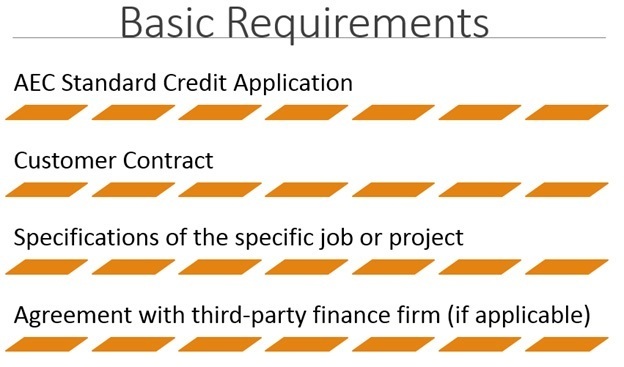 take-out financing upon completion of the job in question. 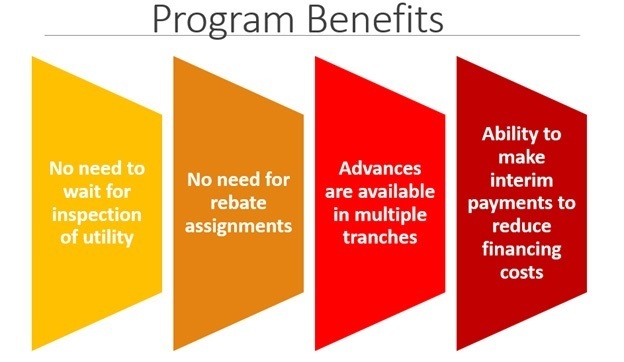 Repayment of the capital will be made by the earlier of either the third-party financing payments or customer payments or a combination. MJ Electrical Contractors have the opportunity to install LED lighting in Ron’s Grocery. Ron’s Grocery is a 77,000 square foot facility, and a big job for MJ Electrical Contractors. The ‘job value’ is assessed to be $40,000. The opportunity for MJ Electrical Contractors is a great one, but the owner Mike is hesitant to take on the project because of the amount of capital he needs to lay out. He doesn’t have the means to pay for this all himself, as the contracting company is involved in other projects as well. 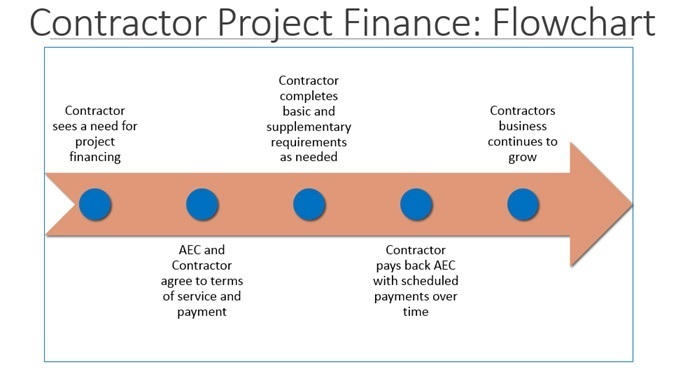 Using the AEC Contractor Project Finance Program, AEC offers Mike $32,000 worth of financing (80% of assessed value). Mike is able to finance the cost of the equipment and supplies needed for the job without constraining his cash flow and affecting his ability to work on other projects. AEC pays the suppliers for the products directly which ensures there is no hassle for Mike in securing payments to the suppliers. 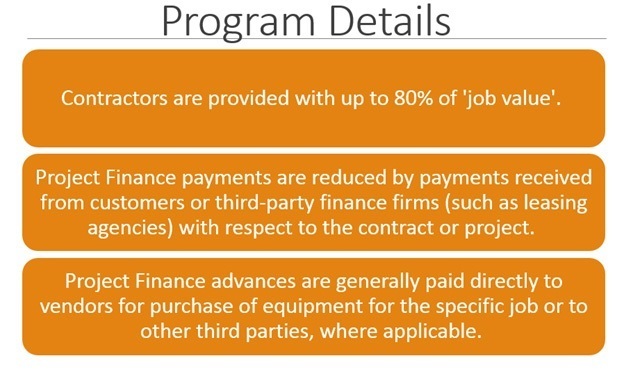 Mike uses money from a leasing company combined with customer payments to pay back AEC for financing the project. The leasing company pays AEC 50% ($16,000) of the loan amount with quarterly payments of $4,000 dollars. Mike uses the customer payments to pay the other $16,000 to AEC over time. Combining customer payments and the third-party financing, Mike is able to pay in smaller increments with a schedule better fit for his business needs and abilities. Because he is able to get his project financed, Mike is able to successfully complete the job at Ron’s Grocery while still maintaining his other projects and keeping his cash flow steady.